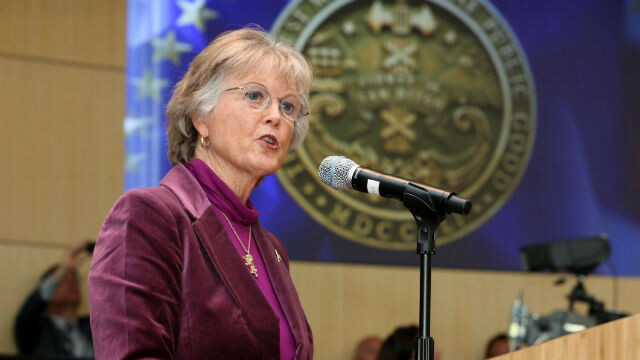 Board of Supervisors Chairwoman Dianne Jacob Wednesday outlined seven ways to better serve the public in the annual “State of the County” address, including improving streets, building parks, tackling the pension problem, serving seniors, increasing technology, maintaining public safety and building bonds in the community. Jacob said the board faces new and emerging challenges, but has come a long way. The county budget may face a $100 million hit if Brown’s state budget is approved and anticipated changes in California’s health insurance marketplace are made, according to Jacob. In her roughly 35-minute speech to a standing-room-only crowd at the County Operations Center in Kearny Mesa, Jacob enumerated the seven areas that the board will focus on in 2017. The first item was maintaining the county’s 2,000 miles of streets. The county’s parks system was next on the list. She said the supervisors need to strip away barriers to building more parks. Confronting the county’s pension challenge was third. Jacob said recent changes to the system will save the pension fund $1 billion over the next 20 years. Preparing for the so-called “silver surge” was another top priority, because residents aged 65 and older are the fastest growing segment of the county, according to Jacob, and expected to double in 20 years. Jacob said she will propose establishing a new position at the county that will be focused on serving the senior community and become the top advocate for the elderly. “A high-profile leader is needed to make sure that all the appropriate arms of county government are working together the best that they can to meet the needs of seniors,” Jacob said. The county has established a smart phone application “Tell Us Now” for county residents to communicate with officials in its effort to become more tech-friendly. “We’re all about better, cheaper, faster, and this is another way to do just that,” Jacob said. While it was mentioned sixth on her list, Jacob said it was the supervisors’ “most important” job to keep the public safe and vowed that the county would “stay battle-ready” on both the law enforcement and firefighting fronts. Building bonds in divided communities was the final item on the Jacob to- do list. She mentioned cultural differences, race relations and tensions between some ethnic groups and law enforcement that hit home last fall with the officer involved shooting of a black man in El Cajon. “That’s the job in front of us, now let’s get to work,” Jacob said.